…[In] A recent study published in the American Journal of Sociology…Researchers Kenneth A. Frank, Chandra Muller, and Anna S. Mueller found that classes have a tremendous impact on high-school students’ social lives…The study analyzed survey data from 3,000 students at 78 schools across the United States and found that classes have a greater impact on friendship formation than sports or other after-school activities. The study also found that friendships tend to form in smaller, more unusual classes: in Latin class or band, for example, rather than gym or a geometry course that all students are required to take. Students enroll in these electives because of they’re interested in the subject, which gives them common ground with the other students in the class. This entry was posted in Uncategorized on February 21, 2014 by msafran. The Department of Classics at the University of Maryland, College Park, is sponsoring a summer study abroad program in Greece from June 3-21, 2014, directed by Prof. Del Chrol of Marshall University (chrol@marshall.edu) and Jacquelyn Clements of Johns Hopkins University (jclements1@jhu.edu). The course is open to all undergraduates and upon completion earns 3 credits. Based in Athens, we will travel to sites in Attica and the Peloponnese such as Eleusis, Corinth, Mycenae, Olympia, and Delphi, as well as the island of Paros. The program focuses on the history and archaeology of Greece with particular emphasis on key issues – intellectual, artistic, political, and philosophical – confronting Athens during the 5th century B.C. In addition to starring in films like Adventureland, The Social Network, and Now You See Me, actor Jesse Eisenberg occasionally writes humor piece for the New Yorker. 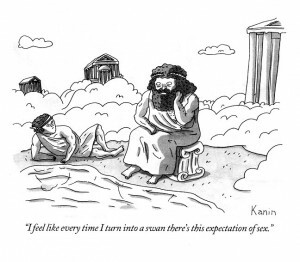 In honor of the opening this weekend of Pompeii (see earlier post “Jon Snow vs. the Volcano”), click here to read Eisenberg’s “Final Conversations at Pompeii”. This entry was posted in Uncategorized on February 18, 2014 by msafran. What Can You Do With a Classics Degree in the New Economy? Susan Bennett graduated from Brown University. Until recently (and it was a secret) she was the voice of Siri, first introduced on Apple’s iPhone 4S. What did Bennett major in at Brown? You guessed it — Classics! This entry was posted in Uncategorized on February 16, 2014 by Gary Reger. 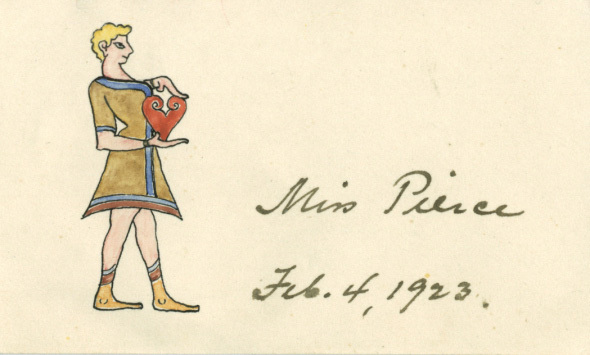 In February 1923, Carl Blegen, then secretary of the American School of Classical Studies at Athens, dispatched a Valentine to his sweetheart Elizabeth Pierce, who was in Rome. Blegen had an artist friend render a Mycenaean figure as an expression not only of his love for Elizabeth, but also his ideas that Greek mainland Bronze Age culture should be seen as distinct from the Minoan culture of Krete. For more about Blegen and Pierce, see the blog of Natalia Volgeikoff-Brogan. This entry was posted in Uncategorized on February 15, 2014 by Gary Reger. Listen to excerpts from Phuc Tran’s TED Talk by clicking here. This entry was posted in Uncategorized on February 12, 2014 by msafran. 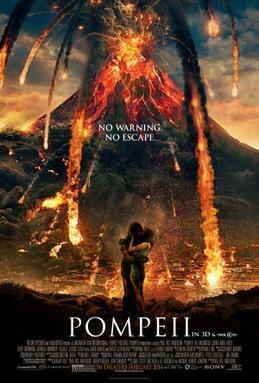 Jon Snow vs. the volcano: “Pompeii” premieres Feb. 21! From the director of “Resident Evil”, “Resident Evil: Afterlife”, “Resident Evil: Retribution”, and the upcoming “Resident Evil 6” comes “Pompeii”, a movie about gladiators loving and trying not to die during the eruption of Mt. Vesuvius. Starring Kit Harrington, a.k.a. Jon Snow from “Game of Thrones”. Will “Pompeii” be amazing, terrible, or so terrible it’s amazing? Find out starting Friday February 21st–in 3D! This entry was posted in Uncategorized on February 11, 2014 by msafran. Sherlock Holmes, in any incarnation, packs a lot of information into his head, and he has to be ready to draw out those details as he makes his deductions and solves the most mysterious of mysteries. The Holmes of Sherlock, the BBC/Masterpiece program that aired its season finale Sunday night on PBS, is no exception. This time, though, his creators have gifted him with a talent for a mnemonic device straight out of ancient Greece—the mind palace. Of course, this being Holmes (and television), his version was somewhat more advanced than that of the average rememberer. According to myth, the Greek poet Simonides of Ceos invented the technique after attending a banquet gone wrong. Simonides stepped outside to meet with two young men. But when he arrived outside, the young men were not there and the hall was collapsing behind him. Though his fellow banqueters were too badly crushed by the collapse for their remains to be identified, Simonides was supposedly able to put a name with each body based on where they had been sitting in the hall. That ability to remember based on location became the method of loci, also known as memory theater, the art of memory, the memory palace and mind palace…. This entry was posted in Uncategorized on February 9, 2014 by msafran. This entry was posted in Uncategorized on February 8, 2014 by msafran.